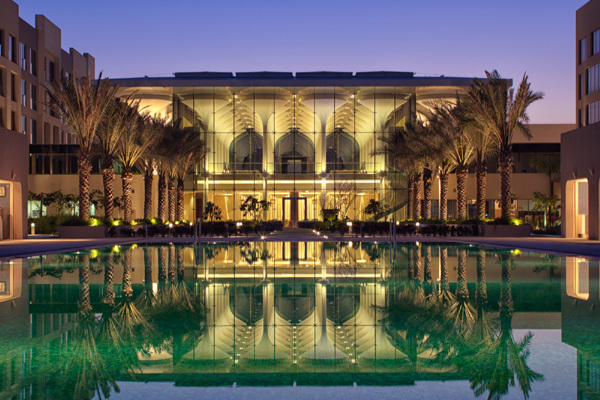 Designed with a variety of local Omani influences, the modern urban resort Kempinski Hotel Muscat has opened its doors to guests from around the world as well as the surrounding community. Encompassing over 6 km of stunning coastline within Al Mouj community, this luxury destination in the capital of Oman blends traditional Omani hospitality with the timeless European elegance of Kempinski. With 310 rooms and suites, state-of-the-art meeting facilities, 10 world-class restaurants and bars, a fully equipped health club and an authentic spa experience, Kempinski Hotel Muscat is a gateway to an authentic Omani adventure. Designed by Woods Bagot, Kempinski Hotel Muscat is a modern interpretation of Muscat and Oman, with standout elements that are truly Omani in nature. The hotel’s buildings, with a façade inspired by the landscape of Old Muscat – such as the Muttrah Corniche – are a matrix of building structures, outlining what was once a commercial centre. The design of the lobby originates from the nature of lilies in a pond and is inspired by the Al Alam Palace, the ceremonial palace of His Majesty Sultan Qaboos. The prominent location of the ballroom – wherein the Muscat Ballroom is situated – establishes a strong first impression, with an architectural design inspired by Arabic lanterns, illuminated in the evening to reinforce the hotel as a landmark in the Al Mouj community. Kempinski Hotel Muscat comes as a dining destination where guests can experience live interactive cuisines at The Kitchen Restaurant or choose to indulge in a delightful Northern Indian experience at Bukhara Restaurant. For light snacks and meals during the day, the Pool Bar team takes care of each guest’s appetite, while relaxing and enjoying the sun. For fans of Thai street food, Soi Soi is the place to be; a lively restaurant reminiscent of Bangkok’s bustling street-food scene. For authentic Indian teas, Boulevard Tea House provides that and more in a cosy setting. Fresh coffee, dainty desserts and pastries can be found at Café One, the hotel’s deli. Amwaj Lounge, the hotel’s luxury living room, sets the scene with a selection of French pastries and afternoon tea. Cigar aficionados can unwind in the opulent 1897 Cigar Lounge & Bar, presenting the biggest collection of Cuban cigars and a wide selection of single malt. Zale, the hotel’s beach club and lounge, is also the only one of its kind in Al Mouj, specialising in globally inspired cuisine, using seasonal ingredients and the freshest local products. At night, this venue turns into a vibrant lounge, a new and exciting addition to Muscat’s night scene. Cosmic Bowling is the only bowling and entertainment centre in Al Mouj, perfect for a fun game of bowling. Guests can also unwind after work or watch the latest sporting events on large screens with a drink in hand and a light snack. Swiss luxury wellness expert, Resense, has carefully crafted the bespoke Kempinski The Spa & Health Club to offer guests memorable experiences inspired by Omani wellness traditions, yet delivered in true European luxury. Designed with guests in mind, the spa offers separate havens for men and women as well as a lavish couples’ suite with private heat and water experiences, a double treatment room, the latest technology in results-driven treatments, and an exclusive health club exclusively for hotel guests and selected members. The gentlemen’s spa is more like a private club complete with a luxurious bathing journey, treatment suites, skilled barber and private relaxation lounge to convalesce afterwards whilst sipping a favourite drink. Ladies can rejuvenate in peace in the ladies’ sauna, steam and hydrotherapy pool prior to relaxing in the lounge or enjoying an advanced cosmeceutical or bespoke body treatment in the ladies’ treatment suites. The health club is a state-of-the-art gym complete with dedicated personal training and assessment room, a female only gym, fitness class studio and a juice bar where guests and members can enjoy healthy infusions and vitamin boosters. The 1,100-sq-m pillar-free ballroom can accommodate up to 700 guests and can be divided into three sections. The striking diamond-shaped building also hosts 11 separate function rooms, featuring natural daylight and conveniently equipped with state-of-the-art audio-visual equipment.